Thank you, Dan, for such a super job transporting my new mare, Zakora, from Colorado to her new home in Arizona. She arrived calm, relaxed and in excellent shape. I truly appreciate your professional and superb care during the long trip. I will certainly recommend you to all my friends who have hauling needs and will not hesitate to call you again if I have any transportation needs in the future! Thanks again! 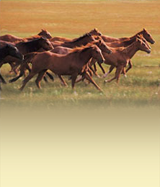 We operate an equine retirement facility, Challis Creek Ranch, in Idaho. Dan has transported horses for our clients on multiple occasions. His courteous, professional and timely service has always proved most satisfactory and as a result, we recommend his services to all our prospective clients in his area. Highly recommended! Our three horses were hauled from Carson City, Nevada to Tehachapi, California in September, 2010. During our move, Dan was so kind and caring, he even took time to help us load our pipe stalls. He was very patient loading our reluctant horses in his clean horse trailer, and he kept in touch with us during the transport. Our moving van was very slow, so he got to our new home with our horses a few hours before we did. He was kind enough to unload our horses and give them a good drink of water before he left. Such a wonderful feeling he left us with! We didn't have to worry about a thing. He is dedicated, knowledgeable, trustworthy and dependable. We are so lucky to have him as our horse transporter. We would highly recommend him and we will call upon him again. We thank him so very much! In June, 2009, my horse, Sweet Prince William was shipped from northwestern New Mexico to his new home near Dallas, Texas during one of the hottest summers on record. Dan Yocum, owner of The Rocking Y Ranch in southern California delivered my 16.3 hand, 8 year old, off the race track Thoroughbred in superb condition. "Will" pranced down the ramp of Dan's trailer in	excellent condition. Dan had stopped every hour to tend to the horses on board by spraying them with cool water, making sure the horses had lots of drinking water available and checking them for heat exhaustion. You see, Dan is not only a hauler of horses, he is a horseman himself. He knows horses and he cares for their well being and comfort. I have spread the word to my hunter jumper / cross country / fox hunting	friends here in north Texas about the Rocking Y Ranch and it's owner, Dan Yocum, who is the best, most caring and knowledgeable horseman in	the business. We live in Nevada and have hired Dan Yocum to transport our Thoroughbred horses on a number of occasions. Dan is not only a knowledgeable horseman, but also possesses a natural calmness and caring demeanor that sets our minds at ease. He treated our horses as if they were his own. Dan's trailer is immaculate and large enough to accomodate 17+ hand horses in comfort. We were very pleased we made the choice to hire Dan versus a stock carrier. Each of our horses got the individual attention they needed and arrived safe, sound, and on time. We would not hesitate to recommend Dan Yocum to anyone needing horse transportation. He is truly a caring professional.